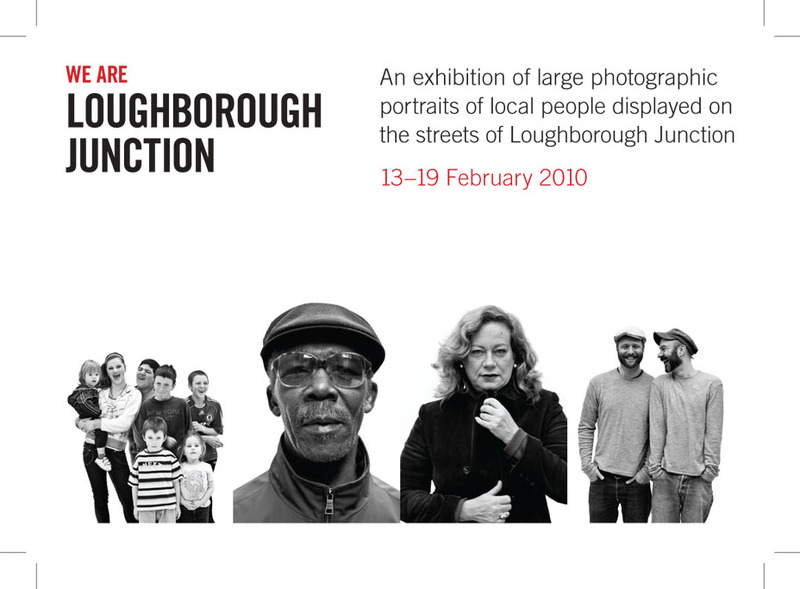 An exhibition of large photographic portraits of local people displayed on the streets of Loughborough Junction. Come and discover this little known part of London and the community that live here. Launch Weekend 13 and 14 February from 11am till dusk. The pictures will be displayed until the 19 February. between 13–19 and make your way round the exhibition. Organised by the community with the generous support of The Loughborough Junction Action Group and the SE5 Forum for Camberwell who will be hosting community events during the launch weekend. Categories: Arts, Community, Events, The L J Action Group | Tags: we are loughborough junction | Permalink. Thanks again for getting involved. Categories: Community, The L J Action Group | Tags: 'We are Loughborough Junction' Photo shoot, loughborough junction, loughborough junction photographs, loughborough junction portraits, Photo shoot, we are loughborough junction | Permalink. The final shoot day for the “We are Loughborough Junction” Portrait project is this Sunday 19th April, in Ruskin Park. If you want to take part (and we want you to take part that’s why I am e-mailing!!) then skip to the end for the timings and shoot details, all will be repeated on Conor’s blog too. Loughborough Junction had a rough ride last year which came to a head with a murder on Northlands Road. However, some good things have come from this as there has been a formation of a residents association in the form of LJAG (the Loughborough Junction Action Group, see below, linked on the local website) as well as a pulling together of people in the community. As a way of attracting attention to Loughborough Junction, LJAG and to foster a sense of community identity Paul Adlam had the idea, last year, of shooting a portrait series of people in the community and putting on an exhibition this Summer on the streets. We are calling it “We Are Loughborough Junction”. I am taking the photographs working with Paul and Matty Matteson. We have already shot a full day of portraits on Southwell Road which drew over 50 people as well as an afternoon beside the train station which drew in 25 more locals. This Sunday is your last chance to take part before we begin preparation for an exhibition on 21st June. I have photographed approximately 85 people so far and would love to get closer to 200. Sunday 19th April from 1pm until 6.30 in Ruskin Park near the Tennis courts on the North side in the middle. The photographs are all in black and white against a white background in daylight. Anyone who lives in or is part of Loughborough Junction is welcome to take part. Bring your friends and family, this is a democratic shoot all are welcome who want to take part. Categories: 1, The L J Action Group | Tags: conor masterson, lougborough junction, photography project, ruskin park, we are loughborough junction | Permalink.